In a world ruled by the dead, we are forced to finally begin living. Robert Kirkman's The Walking Dead is brought to life! Zombie Lurker Action Figure out of the 2010 Eisner Award-winning comic! Features interchangeable accessories and multiple points of articulation. With unique gory play-action, such as an exploding head and removable limbs! In a world ruled by the dead, we are forced to finally begin living. 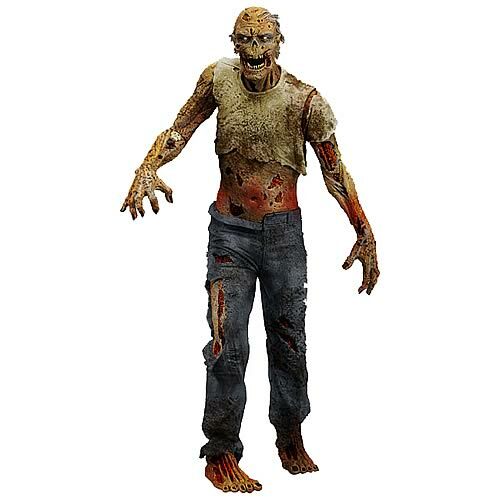 This 6-inch tall figure of Zombie Lurker from the 2010 Eisner Award-winning The Walking Dead is a must-have for any fan of the comic! The Zombie Lurker Action Figure includes multiple interchangeable accessories and several points of articulation, for virtually limitless posing possibilities and customization. It features unique gory play-action, such as an exploding head and removable limbs! An epidemic of apocalyptic proportions has swept the globe, causing the dead to rise and feed on the living. In a matter of months, society has crumbled. There is no government, no grocery stores, no mail delivery, no cable TV. Rick Grimes finds himself one of the few survivors in this terrifying future. A couple of months ago he was a small-town cop from Kentucky who had never fired a shot and only ever saw one dead body. Separated from his family, he must now sort through all the death and confusion to try to find his wife and son. In a world ruled by the dead, we are forced to finally begin living. To order, click on the image below or any link up top.